Q What’s your favourite dish to make at home? A. Lately I’ve been making more vegan food. I try to eat mindfully at home. Loads of vegetables, whole grain, and herbs. Zucchini, mushrooms, and red carrots in winter are my favourites. A. I’m working on a book, and the process of writing the book might also turn into a show. It’s called Eating Stories. When I cooked at the James Beard Foundation, we did a limited edition print of it, which we gave to all the guests there. It’s a continuation of that. The stories are around food, personalities, design and art, and our relationships to food. Q Do you have a favourite restaurant in Delhi? A. I love Café Lota. It’s really wonderful. I also like simple stuff, like Sagar, and Carnatic Café is amazing. It’s so light. Q We noticed you were wearing a sari while manning your design store at the India Art Fair. We loved that. What kind of saris do you like to wear? And tell us about how you wear them, experiment with them? A. I’ve been educated by Rta Kapur from the Sari School. She’s taught me a lot about the unstitched garment. I live by her book, The Sari Book. So I try to wear khadi saris – they get softer every time you wash them. 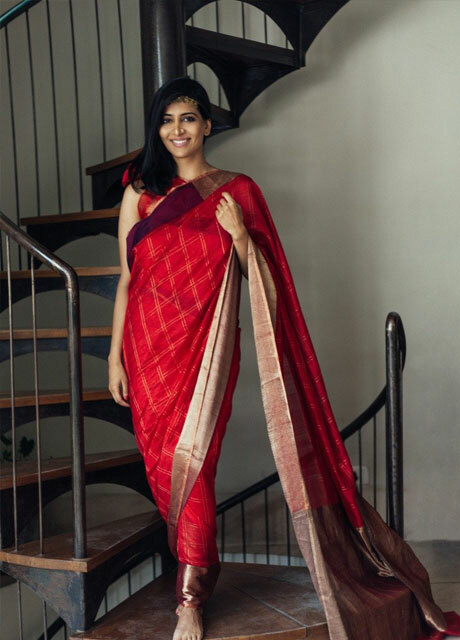 Kapur buys and supports a lot of craftsmen and loomed across india who still use the old-school method of making saris. I also try to learn the styles of wearing saris. I don’t wear a petticoat with my sari. There’s a way of making the old traditions contemporary, and a way of making them your own. The sari I wore at the Art Fair, I had to run around a lot, so I tied it dhoti style – it’s so comfortable. Q Do you have a preference for region, pattern, or design in your saris? A. I like to do the dhoti style that leaves your legs mobile. There’s another style that doesn’t wrap around the lower part of the body – you can adjust it for comfort as well. Q What was your favourite among the things you tried today? A. I liked the pink Anavila sari – it’s so simple and accessible, not a heavy garment that you associate with an uncomfortable experience. You don’t have to be scared of adjusting it to your body, to what’s flattering.